With ever increasing gasoline prices, emissions of harmful gases from fossil-fuel polluting the environment and vigorous campaign by ‘green activists’, electric cars are undoubtedly going to remain popular with public and various institutions. With Toyota announcing introduction of a completely ‘electric plug-in vehicle’ with zero emissions in addition to their Prius model, many more well-known car manufacturers are expected to follow suit. As of now, Toyota Prius is still the huge success story of the leading Japanese automobile giant, both from technological point of view, garnering large share of the market, besides being in the green vehicle genre. The Toyota Prius, being already a 3rd generation vehicle at present, countless number of these types of flourishing hybrids would be introduced by other car makers soon. 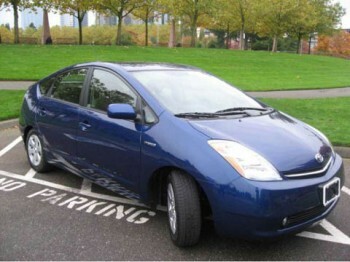 Toyota Prius has already clocked 100,000 miles of running and are being sold at $8000 at present. It is a fascinating option for people particular about buying a reasonably priced, fuel-efficient and zero or minimal emission car. However the main drawback with Toyota Prius hybrid car, though appealing for people with different lifestyles, is its intricate mechanism that only Toyota-trained technicians are aware of. It is, therefore, advisable to purchase only a used Toyota Prius car checked thoroughly by an experienced and well-known Toyota dealer, unless the person trying to buy Prius or his close friend are fully aware of its working. A Prius car that has not been looked after well is susceptible to inverter or transaxle failure, both of them are not only critical parts of the car but are also very costly to replace or even repair. As power transmission of Toyota Prius is primarily a CVT, one should not purchase a used Prius if some jots or jerks are observed in transmission. A new transaxle assembly for the Prius is expected to be around $ 10,000, which is a ridiculous cost for repairs considering that a new car itself will cost only that, much. Other aspects that require inspection before purchasing a used Toyota Prius comprise the ‘front struts’ and ‘rear shocks’, ‘HID headlights’, the 12V battery, excluding the traction unit, the rear brake lights, the inverter cooling pump and the transaxle fluid. Another factor that should be checked is about the availability of maintenance records. These records should indicate that the inverter cooling pump ‘recall’ has been carried out and that the transaxle fluid has been changed as per the suggested intervals. Even before seeking permission of the seller for checking the car, one can make a few preliminary checks. He should switch on the HID headlights and ensure that they still remain lit even after a gap of ten minutes. Similarly, turn on the air conditioner and observe the air coming out of the vents. One should check after ten minutes to see whether air is still chilly and that there are no leaks underneath the engine’s water pump. The original 12 volt battery is expected to be generally defective and is therefore advisable to have the battery replaced with a battery purchased from aftermarket or secondary market where car parts are sold. Although it may appear that replacing a brake light switch is a trivial issue, it is still a complicated job as it will also require changing the pedal assembly. The design of Toyota Prius is complicated that in any other traditional car, these small defects can be easily rectified. If a lot of small defects are noticed in the Prius one intends to buy, it would be advisable to check another car instead of purchasing a used Toyota Prius car with so many defects, as repairs will far exceed the purchase price a new car.